Cerwin Vega performance in a compact design. With a power handling of up to 125W, these little speakers sound really big. 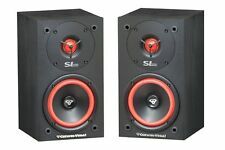 SL-5M 5.25" 2-Way Bookshelf Speaker, 125 Watts (Pair). The sleek bookshelf speaker features a classic design with a removable grill and an internal brace to reinforce the structure and eliminate resonance inside the cabinet. TDX's pair of two-way bookshelf speakers features a 5/8" polycarbonate ferrofluid cooled tweeter combined with 6-1/2" polypropylene woofer. You can count on these speakers to provide you with a smooth, acoustically accurate performance at an unbelievably affordable price. 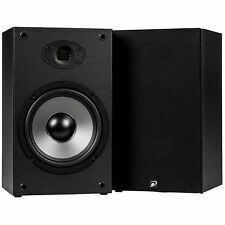 Polk Audio TSi100 Bookshelf Speakers (Pair, Black) USED Great Condition. Condition is Used. Shipped with USPS Parcel Select Ground. 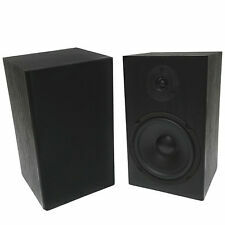 Acoustic Audio AA321B Indoor Mountable Black Full Range Speaker Pair. Bookshelf Speakers. Acoustic Audio's Indoor Speakers are perfect for any occasion or application. They were designed with durability in mind, so there is no need to worry about wear-and-tear. 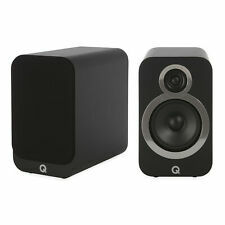 (2) 3020i Bookshelf Speakers (Carbon Black). 3020i Features They utilize Point-to-Point™ (P2P) bracing to improve focus of the stereo image, have slightly taller and deeper cabinets that allow an extended low-frequency response from the ported design, and a high-frequency driver unit with the tweeters decoupled from the baffles. BOSE 141 SPEAKERS. Fully Tested. Very clean. Speakers in very nice condition. For sale is a gently pre-owned pair of Cambridge Soundworks Speakers Pair M50 in a dark gray. The speakers have been fully tested and sound wonderful. I don’t see any damage on the drivers, grills, and the cabinets look great. Tons of life left in these speakers. Please note the package will only ship in the continental United States and will not be shipped to a post box. Fast shipping!! All packages will go out within 24 hours. Please note that packages being shipped Economy, typically arrive in 5-8 business days. I'm proud of my feedback rating and will do everything I can to make sure you are completely satisfied. If you have any questions, please feel free to contact me. Speakers sound great. Perfect for office or bedroom. Condition is Used. Note that these aren't powered speakers-- you need a receiver to put power to them (you can't just plug in your laptop or phone). In fact, with its dynamic quality, superior sound and visual appeal, you’ll find this speaker simply irresistible. 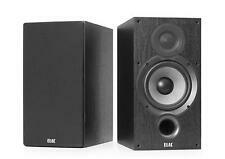 Monitor Audio Bronxe 2 bookshelf Speakers Black Oak pair. Condition is Used. Monitor Audio's Bronze 2 bookshelf speaker builds on the strength of its predecessor the Bronze BX2's audiophile credibility with a neutral tonal balance and high detail resolution combined with high overall efficiency and power handling. Very lightly used, maybe 3 months, and then I moved. The new house has in wall speakers so selling these. Comes with original box, speakers, covers, and all books/manuals. 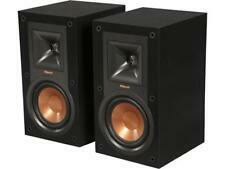 Klipsch R-15M Bookshelf Speakers - Black (Pair). Condition is Used. Shipped with USPS Parcel Select Ground. DCM KX6 Series 2 Loudspeakers Bookshelf Speakers. Really nice looking pair only has minor scratches on the bottom but not gouged i think they will clean up it looks like its just paint from a shelf. The construction of the LS50's cabinets plays a big part in their sound. The LS50 is one of the most award-winning speaker products ever released by KEF, receiving accolades from such publications as Stereophile, What Hi-Fi, and The Absolute Sound. Good used condition with a couple knicks or scratches, see photos. Klipsch KG.5 Black Oak Woodgrain Cabinets Nice Low Bass with Tweeter Bookshelf Audio Speakers. in Good Very Condition with some Minor Scratches. No Covers Shipped with USPS Parcel Select Ground. Boston Acoustics Bookshelf speakers HD5 (pair). Condition is Used. Shipped with USPS Priority Mail. Bookshelf Speakers. Indoor and Outdoor Speakers. High efficiency design creates full, spacious, clear sound with as little as 10 watts. Speakers have 4" bi-laminate composite, balanced drivers and 1" ferro fluid cooled, titanium coated, balanced tweeters that are shielded to protect TV's and other components. One Pair of Bose 141 Series II Bookshelf Speakers. Box only opened to take pictures. YAMAHA NS-10MMT SPEAKERS. Finish: Faux Cherry Veneer. Year of manufacture: 2000. CONDITION: These are in excellent & tested condition. Working perfectly. They are consecutive serial numbers. One corner edge ding (see close-up). JBL ES10 One Pair 3-Way 4” Bookshelf / Wall-Mount Satellite Speakers MINT. Condition is Used. Shipped with FedEx SmartPost.